Item # 312528 Stash Points: 2,495 (?) This is the number of points you get in The Zumiez Stash for purchasing this item. Stash points are redeemable for exclusive rewards only available to Zumiez Stash members. To redeem your points check out the rewards catalog on thestash.zumiez.com. Don't let the laidback vacation vibes end when you travel back home by rocking the new FILA Floral Printed Navy T-Shirt, now available in youth sizing! Across the chest features signature FILA logo script while the entire garment is covered in red, navy and white floral graphics; a classic FILA colorway. 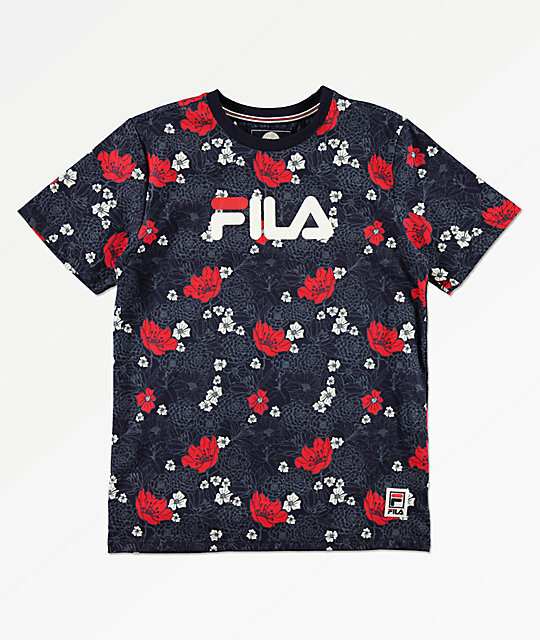 Floral Printed Navy T-Shirt from FILA. Red, navy and white floral graphics throughout garment. Screen-printed logo script on chest. Embroidered logo patch on front bottom left. S 25" - 27" 52" - 56"
M 28" - 30" 56" - 58.5"
L 31" - 33" 59" - 64"
XL 34" - 35.5" 64.5" - 66"